Pixie, my Rottweiler, is always right their. If she hears a loud voice she is sure to belch a thunderous bark back. My children ride her like a donkey. My 5 year old dresses her and pulls on her ears. She always walks away if she gets over whelmed. I have owned different breeds in the past, but Pixie has a soul, and is highly intelligent. 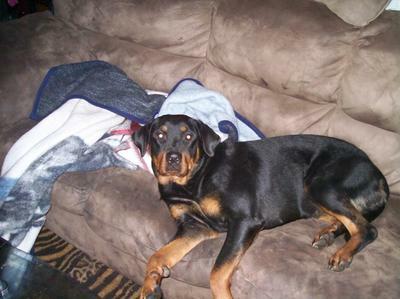 She is an undocked Rottweiler (see the long tail), she is a registered service dog and she is a part of our family. I dread the day Pixie has to go but I will love her forever. Shes now 3 years old. I just wish breeders would try adding longevity of life to dogs. I'll always provide a good home to this breed and it will be the next I get. Sounds like you love your dog as much as we do. The "longevity gene" would be great about now since our Chocolate Lab, Bailey, is 13 1/2 and probably not going to be with us too much longer. Our kids are almost grown and Bailey was there for most of their childhood. Big dogs like Rottweilers and Labrador Retrievers don't tend to have long lives, but we have been fortunate and I wish you the very best with Pixie.